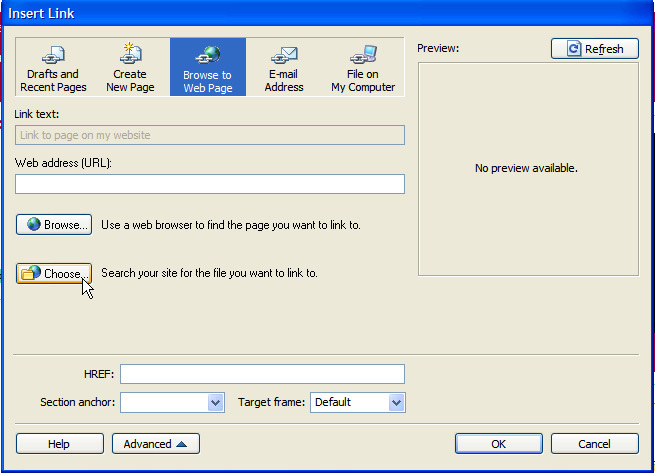 How to insert a link to a web page on your website? Enter the text for the link in one of the content areas of the page and highlight that text. The text for links should be meaningful when viewed out of context with the surrounding text. Avoid text for links such as click here. Instead use a link that is meaningful when read on its own such as click here for more information on inserting links or simply how to insert a link. Ontario's new accessibility laws require that the text of a link must make sense out of context with the surrounding text. The reason is that visitors who are visually impaired with use the tab key to jump to the link without necessarily hearing any of the surrounding text. 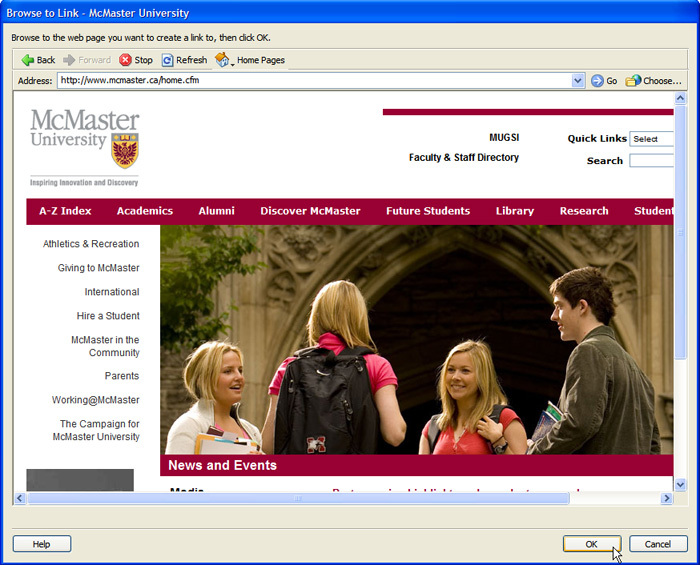 Visitors who view the page visually can scan for meaning in the surrounding text, but it is much more difficult for visually impaired visitors. Click the Insert Link icon in the Contribute toolbar. 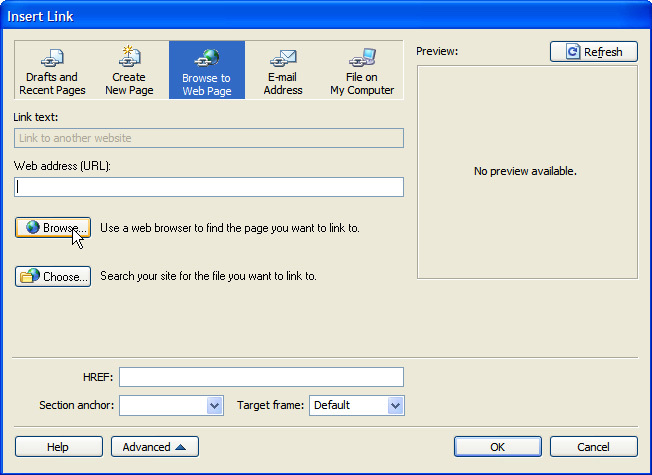 Select Browse to Web Page from the drop down options. If the page already exists in the navigation structure of the website, you may find the page by browsing to it. In the Insert Link dialog box, click the Browse button. In the Browse to Link dialog box, click on links or enter a URL in the address bar just as you would browse to a web page in your browser. 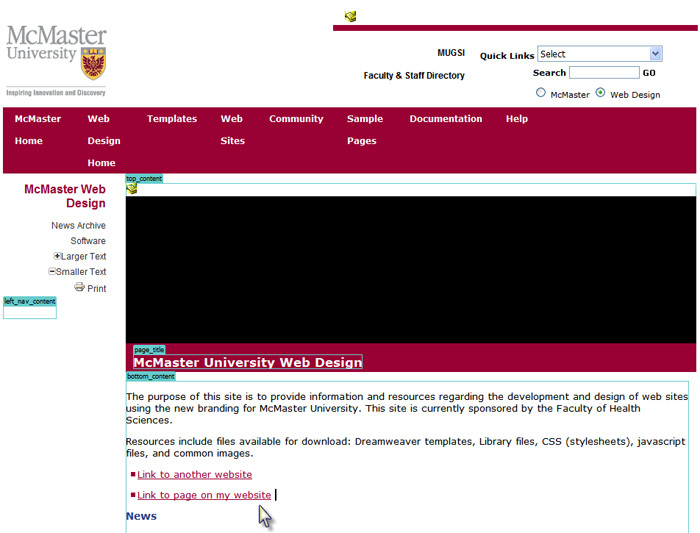 When the page you want to link to is displayed in the browser window, click OK. If the page either does not exist in the navigation structure of the website or you prefer to search for the website page in this way, you may find the page by browsing to it. In the Insert Link dialog box, click the Choose button. In the Choose File or Blog Entry dialog box, you will be looking at how your website is orgainzed into folders on the server. 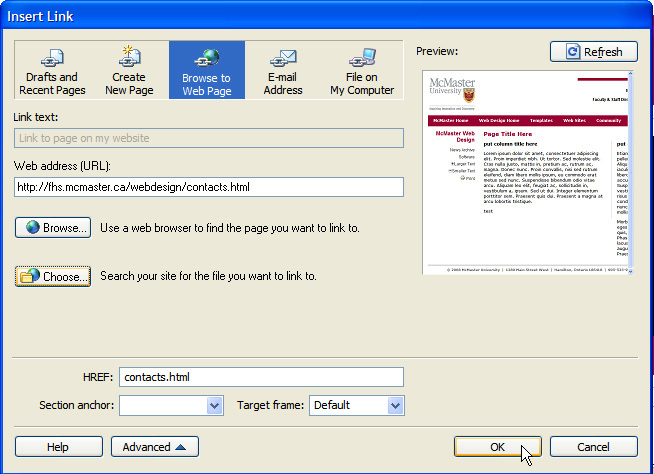 Open folders and browse files until you find the file that is the page where you want the link to take visitors. (Browsing the server folders is similar to browsing foldersusing Windows Explorer on your local hard drive.) Highlight the file (or page) for the link. 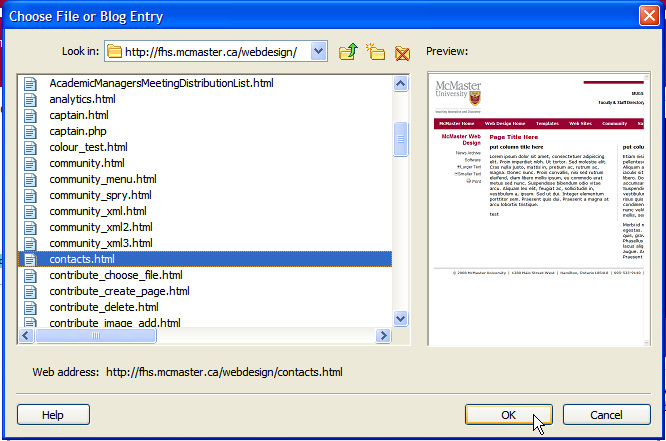 A preview of the page will appear in the dialog box. Click OK . The link with a page preview will appear in the Insert Link dialog box. The link will appear where you had highlighted the link text.